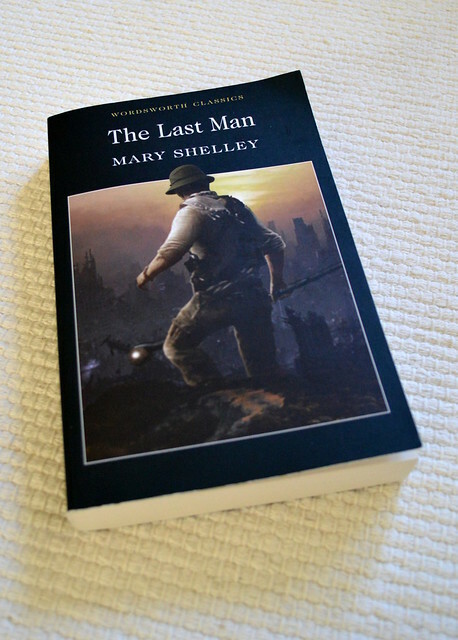 Book number two in my latest reading project is The Last Man by Mary Shelley. By far best known for her 1818 novel Frankenstein, Shelley originally published The Last Man in 1826. The Last Man is often described as apocalyptic science fiction, as the world is ravaged by a terrible plague. I think I’d prefer to call it speculative than science fiction, maybe, for there aren’t that many scientific elements in the book. She did envision long-distance travel with balloons with feathered wings, though, plus mysterious sightings of a black sun and three other suns in the sky in addition to our regular sun, but those might more properly belong to a mythical than scientific realm. Also, with regard to infrastructure, social interactions and food and commodities production, the society is basically the late Regency to early Victorian England that Shelley intimately knew. Anyway. The novel follows the life of our protagonist, Lionel Verney, and his close circle of friends and family from 2070s to the end of the century; indeed, it ends at the beginning of year 2100. The story is divided into three books. The first book describes the early stages of Lionel’s life, the middle one is where the plague starts gathering steam and the last book is where Lionel becomes the eponymous man. The novel’s outlook is very grim, especially in book three where people drop off like flies. Lionel is the only person who catches the plague and survives; everyone else dies (but mostly discreetly like polite society requires). There’s a glimmer of hope at the end, though: on the last pages, Lionel makes plans to sail a small boat around Africa towards the Indian Ocean in search of other survivors (not forgetting a dog; you gotta have a goggie). I’m not big on dystopias, so I had difficulties motivating myself to get back to The Last Man. Also, Jane Austen may have ruined Regency / Victorian writing for me; others simply pale in comparison to her skill. Nevertheless, the novel is well crafted, taking into consideration changes in language and pacing. (There’s no escaping the fact that a lot of Shelley’s vocabulary sounds stuffy and pedantic today, and long monologues are also out of vogue.) Psychological tension, especially, increases steadily from book to book. In book one, you’d have a hard time guessing the story is apocalyptic; in book three, the stress and hopelessness are palpable as the troupe of surviviors, already small at the beginning of their journey and diminishing almost with every step, makes their way from France to Switzerland. Shelley clearly has literary chops; I’m very curious of what she would write had she lived in our day and age. A free e-version of The Last Man is available on Project Gutenberg.